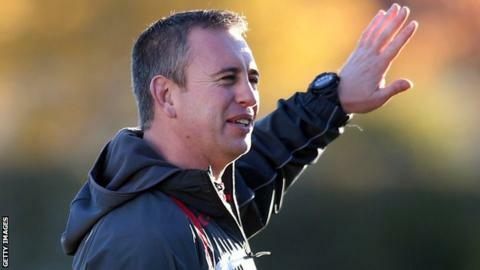 Steve McNamara's exit as England coach was badly handled by the Rugby Football League, says his club boss. McNamara's contract was not renewed after the 2-1 series win over New Zealand in November. The 44-year-old was replaced by Brisbane Broncos coach Wayne Bennett. Sydney Roosters coach Trent Robinson, who hired McNamara as his assistant in 2013, said: "Steve did an amazing job and has just won a series. The way he lost his job was poorly handled." Robinson said McNamara had every reason to be optimistic about getting another contract given the way he had developed the game during his five years in charge. "The last two weeks have not been easy for Steve," said Robinson. "He is a strong man, who has done well in coaching over the years and we have had to support him." Robinson does accept in Bennett, the RFL have appointed one of the best coaches in the game as McNamara's replacement. "Wayne is definitely going to do a great job, he always has everywhere he has gone," he said. "The players should be excited about playing under him." Both McNamara and Bennett are in England for the World Club Series. Sydney Roosters open the three-match weekend at St Helens on Friday, with Brisbane playing Wigan at the DW Stadium on Saturday. That game gives Wigan and England captain Sean O'Loughlin a chance to impress his new national boss, who will not return to England until he takes charge for the Four Nations tournament in the autumn. "We are focused on doing our utmost for the club, although it probably will be a thought after the game," said O'Loughlin. "It is a good opportunity for Wayne to see a bit of English rugby and some of the players he might be coaching." O'Loughlin is not anticipating a formal introduction. "Everyone knows exactly who he is. He is a massively well known coach," he said. "I am sure his focus will be on Brisbane, not introducing himself to us."